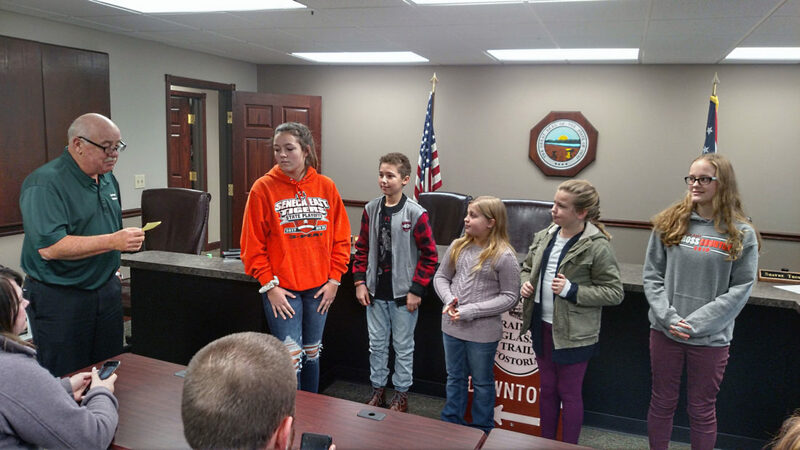 PHOTO BY VICKI JOHNSON Mike Kerschner (left), president of the Seneca County commissioners, Tuesday recognizes the winners of the Seneca County Museum advisory board’s 2018 poster contest (from left) Livyana Kaiser, Vincent Kidwell, Olivia Dotson, Brooklyn Riggs and Alexis Margraf. Aubrey Gottfried, Grace Tackett, Caden Elchert and Tory Losey were not able to attend the commissioners meeting. Seneca County commissioners Tuesday voted to approve nearly $2 million in capital improvements for 2019. Included in the $1,999,046 capital budget are 1,065,746 for equipment, $300,000 for the Jobs & Family Services complex, $16,000 for the Agriculture Center, $50,000 for the jail, $20,000 for the Seneca County Museum, $300,000 for the County Services Building, $28,300 for the RTA Building, $20,000 for building on the Ag Center property; $10,000 for the Public Safety Building, $14,000 for the Youth Center, $75,000 for the annex and $100,000 for contingencies. Last week, commissioners approved a $17.47 million General Fund budget. President Mike Kerschner said $3.3 million in projects are to take place in the county through the Ohio Public Works Commission, according to information from the county engineer’s office, with $868,234 in OPWC grant funding and $225,108 through an interest-free loan. Projects to be completed are resurfacing Catherine Street in Green Springs, $145,400 total cost with $101,780 covered by a grant; resurfacing Kansas Street in Green Springs, total cost $155,900 with a $106,955 grant; Tiffin’s 2019 street repaving program, total cost $832,712 with a $247,400 grant; Reconstruction of SR 101 in Jackson and Liberty townships, total cost $156,730 with a $61,125 grant; Fostoria’s North Main Street improvements, total cost $775,215 with $225,107 grant and a $225,108 loan; widening of CR 592 and CR 26, total cost $1,258,670 with a $125,867 grant. • A $68,000 supplemental appropriation to the Child Support Enforcement Fund for contract services. • A $5,000 supplemental contribution to the Real Estate Assessment Fund for equipment. • A $156,000 supplemental appropriation from the General Fund to the Capital Improvements Fund. • Repayment of $243,107 from the 2017 Community Development Block Grant Fund back to the General Fund. The General Fund previously provided an advance for CDBG projects. The board also approved making an application for a Substance Abuse and Mental Health Services Administration Grant on behalf of Oriana House substance abuse and mental health treatment center. Also Tuesday, Commissioner Holly Stacy reviewed information from the Seneca County Board of Elections recommendation on buying new voting equipment. The board recommended a $422,000 purchase of ExpressVote equipment from Election Systems & Software, of Omaha, Nebraska. New equipment is mandated by the Ohio Secretary of State’s office, and the state is contributing $648,000 toward the purchase. Total equipment cost would be $1,065,000. Purchasing the new machines would require setting aside $16,650 per year for maintenance. Stacy said the commissioners plan to look into the matter further before making a decision. In addition, commissioners recognized the winners of the Seneca County Museum advisory board’s 2018 poster contest. Winners in the third- and fourth-grade division were Olivia Dotson, of Noble; Aubrey Gottfried, of Mohawk; and Grace Tackett, of Old Fort. In the fifth- and sixth-grade division, winners were Vincent Kidwell, of Tiffin Middle School; Brooklyn Riggs, of Noble; and Caden Elchert, of Tiffin Middle School. Winners in the seventh- and eighth-grade division were Livyana Kaiser, of Seneca East; Tori Losey, of Hopewell-Loudon; and Alexis Margraf, of Seneca East. Each of the 134 participants received a county museum T-shirt, and the winners were awarded prizes of $250, $100 and $50 respectively. The winners previously were honored during an event at the museum Saturday. President Mike Kerschner and Stacy briefly discussed the board’s meeting days for 2019, and asked for input from people attending the meeting. They decided to get input from Commissioner Shayne Thomas, who was absent. Commissioners delayed a planned executive session to discuss the sale of property. The board is to meet at 10 a.m. Thursday at their office, 111 N. Madison St.